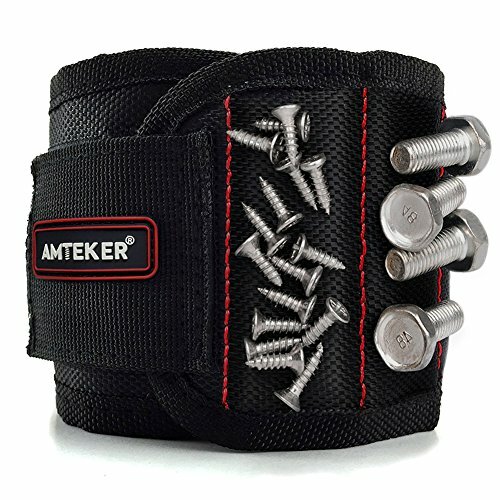 10 STRONG MAGNETS - embedded in each wristband surround almost entire wrist for holding screws, nails, bolts, washers, drill bits. Perfect for home improvement, construction, carpentry, auto repair, sewing, and other DIY projects. EFFICIENCY - An extremely good helper like your third hand. Don\'t worries from searching for small parts in the toolbox or your pockets, fully improving your work efficiency. UNIQUE GIFT - Awesome gift idea for DIY, handyman, father, boyfriend, men, or women. You won\'t know you need magnetic wristbands until you have one! ADJUSTABLE FIT SIZE - Amteker Magnetic Wristband can be adjusted to fit any wrist, unisex design that will suit both men and women. MAXIMUM COMFORT - The breathable mesh and lightweight design allows maximum comforts for the whole working day. 100% money back guarantee!